Do you enjoy writers like Lee Child, Robert Crais, James Patterson, Stieg Larsson? … then you’ll love the Angels’ Share series, even if it is a darker take on the whisky version. COULD THESE BE the tip of a corrupt iceberg? Makes you think – how many more examples of waste, fraud and incompetence do we need? Imagine you’re in public office and know about wrongdoing. In spite of that, how do you stand up against coercive, potentially criminal, pressure? THE ANGELS’ SHARE series crashes, head-on, into the sad reality of Establishment corruption, greed and cover-up. THE STORY IS human, the violence realistic and the context shameful. It’s a wild tale of greed, danger and strong relationships. PASSIONATE, ROMANTIC LOVE lights the story, yet there’s a dark side. Vitriolic hatred burns twists minds and permits criminality in areas you might not expect. It makes for a fearsome world out there. 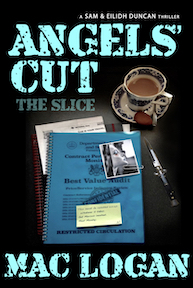 Angels’ Cut is more than a British detective thriller. Angels’ Cut blasts into breathtaking action as it exposes the cruel realities of high-level corruption and cover-up. MAC LOGAN builds on personal experience and research. THE INVESTIGATION gains traction, and pressure mounts, as a detailed dossier of criminal activity stays hidden. 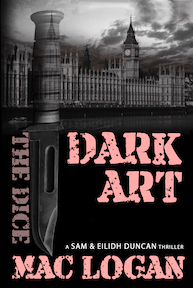 Dark Art widens the tale as it reveals corruption, crime, amazing characters and lethal international action in London, France, Northern Ireland, Scotland and the USA. WHERE IS the dossier the criminals fear? HOW CAN the investigators be silenced? 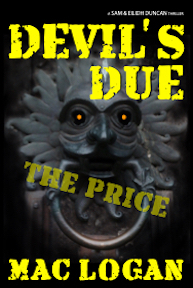 Devils’ Due exposes more deadly secrets. The words stop-at-nothing earn new meaning. How high a price will people pay?